Air Force Base No. 1 has a unique historical heritage, built throughout 89 years since, in February 1920, the Military Air School was installed there, following the first restructuring of military aviation, resulting from the transfer to the grounds in Granja do Marquês of the pioneering Military Air School at that time installed in Vila Nova da Rainha. Air Force Base No. 1, as it became known in 1939, is thus the oldest and most emblematic unit of the Air Force, cradle of this Branch of the Armed Forces and of the military and technical training of thousands of airmen that rendered the Fatherland such exalted services, opening air routes between the four corners of the earth and showing great and unyielding valour in combat. The excellence in military training and the servicemen trained here are the base and the framework of the operational squadrons, providing as such a permanent and effective contribution for the setting up of air force units which, throughout the last three decades, have taken part in missions of cooperation and peace support in Africa, the Balkans, Asia, and in the Middle and Far East, contributing with dignity to the image of the Base Unit which trained them as military pilots. Air Force Base No. 1 continues as an essential component of the operational body of the Air Force and will maintain, in the foreseeable future, a highly relevant global activity, concentrating elementary and basic Air Force flying instruction and continuing to provide its useful support to the Air Force Academy, to the Air Museum and to other civilian and military bodies. The President of the Republic decided to decorate Air Force Base No. 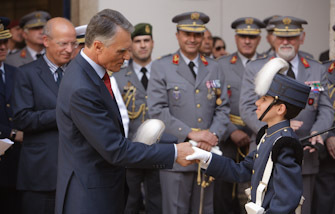 1 as an Honorary Member of the Military Order of the Tower and Sword, Valour, Loyalty and Merit, considering as extremely relevant the services rendered by this Unit to the Military Institution and to the Country, from which exceptional honour and glory resulted for Portugal.